Traditional skin kayak builders will tell you that the kayak must fit the individual. We like to carry that over to all our products, including dogsleds. 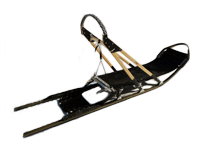 What that means is that we want the sled to fit your body size, style of riding, breed of dogs, trail conditions, cargo weight, and any other special considerations. We use a variety of materials and techniques to tackle this. If you can dream it, we can build it. We focus on using the highest quality materials available. 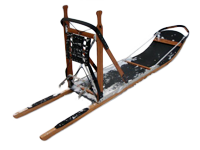 Sleds can be built on laminate ash runners, aluminum Matrax or Rex runners, or our own composite runners. Stanchions are made from your choice of either quality laminate White Ash or Hickory, as well as, reinforced with carbon fiber, kevlar, and fiberglass sleeving for additional costs. We also build sleds with aluminum or hollow carbon fiber shaft stanchions if weight is a larger concern than strength. We use the highest quality hardware, using the strongest stainless steel corrosion resistant fasteners available. We use a mix of traditional and space age materials. White ash (left) is the traditional sled building wood. Very strong, flexible and resilient. White Ash is the only wood used by DogPaddle Designs for laminated runners and other steam bent members. Hickory (second from left) is a super strong wood also used for baseball bats and axe handles, it rarely breaks, but is not as flexible as other woods. Hickory is not as resistant to rot as other species. Bi-axial Carbon Fiber (Third from right), can be used to strengthen our wood stanchions or can be used alone as a hollow stanchion providing extreme strength for the weight. Carbon Kevlar (Third from left) can be used over our ash runners to provide a strong and flexible skin to protect and increase the life of wooden runners. Aluminum (Second from right) is used throughout our sleds for runners, stanchions, and connecting members. 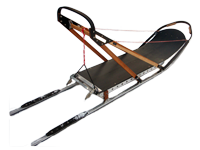 UV protected UHMW plastic creates the majority of the durable and flexible parts of our sleds. Each of these materials work well for different applications. 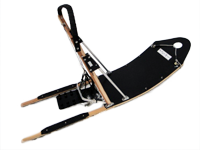 We can build you the sled that combines the correct materials for your mushing application! 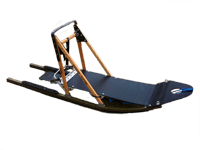 DogPaddle Designs is always developing and testing new and different dogsled designs as well as building custom sleds, so check back for more designs in the future. 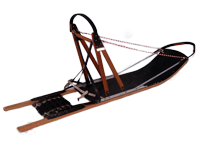 Choose one of the sled types to the right for more information or learn more about our custom sleds. If you can dream it.. we can build it! 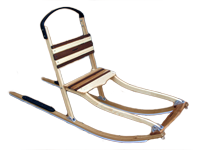 We also sometimes have used sleds available for sale.